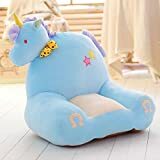 The plush chair features a thick,cushioned seat designed for lounging.The kid-friendly size and soft,fuzzy material make it a super-comfortable addition to any habitat!It makes a comfortable spot to sit after a long day of playing outside, or just relaxing at home. Each chair is created with unsurpassed attention to detail,and it’s made of soft and good material.This chair is light-weight,and easy for children to move around.It’s a great addition to any child’s room,or even just for a play room. The removable and machine washable slipcover keeps the sofas in great condition making them 100% mom approved! If you have any questions,please contact us immediately,we promise to answer you ASAP.Thanks for your trust.